The BM-21 "Grad" (Russian: БМ-21 "Град", lit. 'Hail') is a Soviet truck-mounted 122 mm multiple rocket launcher. The weapons system and the M-21OF rocket which it fires evolved in the early 1960s and saw their first combat use in March 1969 during the Sino-Soviet border conflict.BM stands for boyevaya mashina (Russian: боевая машина – combat vehicle), and the nickname grad means "hail". The complete system with the BM-21 launch vehicle and the M-21OF rocket is designated[by whom?] as the M-21 field-rocket system. The complete system is more commonly known as a Grad multiple rocket launcher system. In NATO countries the system (either the complete system or the launch vehicle only) was initially known as M1964. Several other countries have copied the Grad or have developed similar systems. BM-21-1 launch vehicle during a military parade in Yekaterinburg, 9 May 2009. The M-21 field rocket system with a BM-21 launch vehicle (122 mm multiple rocket launcher (MRL) system) entered service with the Soviet Army in 1963 to replace the aging 140 mm BM-14 system. The launch vehicle consists of a Ural-375D six-by-six truck chassis fitted with a bank of 40 launch tubes arranged in a rectangular shape that can be turned away from the unprotected cab. The vehicle is powered by a water-cooled V-8 180 hp gasoline engine, has a maximum road speed of 75 km/h (47 mph), road range of up to 750 kilometers (470 mi), and can cross fords up to 1.5 m (4 ft 11 in) deep. 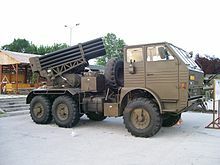 The original vehicle together with supporting equipment (including the re-supply truck 9T254 with 60 rockets) is referred to by the GRAU index "9K51"; the launcher itself has the industrial index of "2B5". In 1976, the BM-21 was mounted on the newer Ural-4320 six-by-six army truck. 9P138 launch vehicle of the Grad-1 multiple rocket launcher system. BM-21: Original version known as the BM-21 launch vehicle. The launcher unit was mounted on a modified Ural-375D truck chassis. BM-21-1: Launch vehicles are mounted on a family of Ural-4320 truck chassis. 9P138 "Grad-1": lighter 36-round version, mounted on a six-by-six ZIL-131 chassis. The vehicle with supporting equipment (rockets, transporter 9T450 and re-supply truck 9F380) is referred to as complex 9K55. The 9P138 can only use "short-range" rockets with a range of 15 km (9.3 mi). It used to be known in the West as BM-21b or M1976. BM-21V "Grad-V" (Vozdushnodesantiy – 'airborne') (NATO designation M1975): Developed for Soviet airborne troops in 1969. A GAZ-66B four-by-four truck chassis is fitted with a 12-round 122 mm rocket launcher. The vehicle is sturdy enough to be air-dropped. Parts of the vehicle such as the canvas cab roof can be taken off or folded down to reduce its size during transit. Like the BM-21, the BM-21V has stabilizing jacks on the rear of the vehicle for support when firing. The launch vehicle has the industrial index of 9P125. 9А51 "Prima": 50-round launcher on a Ural-4320 5t chassis. The vehicle together with fire control equipment, the ammunition transporter TZM 9T232M and the new rocket 9M53F is referred to as complex 9K59. Apparently only a small number was produced. "Grad-P Light portable rocket system": The complete system comprises a 9P132 [vi] single-round man-portable launcher (it can be reloaded and used again), a 9M22M 122 mm high-explosive fragmentation rocket and a fire control panel. The system was developed in the middle of the 1960s for Soviet special units and was used by Vietnamese forces at war with the US, under the designation DKZ-B. It was not accepted for regular service with the Russian Army, but it was and is still popular with paramilitary and guerrilla forces. 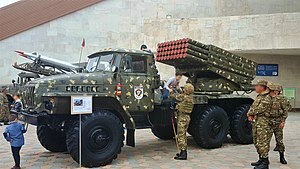 BM-21PD "Damba" (Protivodiversionnyi): 40-round launcher mounted on Ural-375D or 43201 truck chassis. Developed for protection of naval bases against underwater infiltrations, uses special ammunition PRS-60 (Protivodiversionnyi Reaktivnyi Snaryad). The vehicle together with ammunition transporter is referred to as complex DP-62 "Damba". A-215 "Grad-M": 22-round naval version, entered service in 1978. 9K51M "Tornado-G": an advanced version of the original BM-21 vehicle with sophisticated fire control system, satellite navigation, and automatic target aiming. BM-21A "BelGrad": This is a modernized version, based on a MAZ-631705 6×6 truck with 425 hp diesel engine TMZ-8424. Between the cab and the launcher there is another pack of 40 rockets. The system was evaluated from 1997 and entered service in 2001. BM-21M "Grad-U": Ukraine also has switched the original Ural-375 truck with gasoline engine for a new truck with diesel engine, the KrAZ-6322-121. Some vehicles have a longer chassis with 40 additional rockets. Type 81 SPRL: The People's Republic of China produces the Type 81, which was copied from Russian BM-21s captured in the 1979 Sino-Vietnamese War. After reverse engineering, it entered service with the PLA in 1982 where its upgraded version nowadays known as PHZ81. Due to the fact that it is a direct copy, the Type 81 is extremely similar to its Russian predecessor. Its 40 tubes are mounted on a Shaanxi Automobile Works Yan'an SX2150 six-by-six truck, which unlike the original Russian version, has a cab protected by blast shields. RM-70 launch vehicle, a Czechoslovak variant with the BM-21 launch vehicle launcher unit. WR-40 Langusta, a deeply modernized and automated version, of the Soviet BM-21 based on the Jelcz P662D.35 6x6 truck; displayed at the MSPO 2007. WR-40 "Langusta" (eng. European spiny lobster) (wyrzutnia rakietowa means rocket launcher): This is a modern Polish version with a new fire control system (with ballistic computer BFC201 and navigation system Sigma 30) and a modified launcher based on the Jelcz P662D.35G-27 6×6 truck, produced by Jelcz Komponenty. The first vehicle entered service on 20 March 2007. 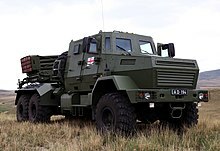 Probably about half of all 227 Polish BM-21 launchers will be converted into WR-40 launchers. New, modern types of munition were also developed for the launcher: the range is approximately 42 km (26 mi) for fragmentation-HE rockets "Fenix" and 32 km (20 mi) for cargo rockets. The Jelcz P662.D.35 truck with lightly armoured cab is also believed to be the base of a Polish multiple rocket launcher complex, which will possibly be developed in the future. 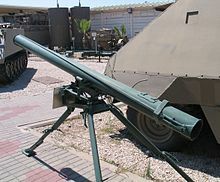 Hamas have used small man-portable single-tube launchers for rockets in attacks against Israel, designated 122 mm 9P132/BM-21-P. The 122 mm Grad rockets used in Gaza have a range of about 40 km (25 mi), and can reach the Israeli towns of Ashdod, Beer-Sheva, Ofakim, Gedera, Kiryat Gat, Ashqelon, Sderot, Rehovot, Kiryat Malachi and Gan Yavne. The Islamic Jihad also published a clip claiming device mounted used as a multi-barrel rocket launcher on vehicle used for first time in Gaza. On 7 April 2011, the Iron Dome system successfully intercepted a Grad rocket launched from Gaza for the first time. The rockets were launched without their dedicated platforms and by untrained operators which causes very low accuracy. Over 50% of the rockets miss entire cities and over 10% end up hitting the sea. MRL 122 mm M1977: U.S. DIA code for a system that appears to be a direct copy of the BM-21 "Grad". D.I.O. from Iran produces copies of the BM-11 and BM-21 systems that can fire the original Soviet rockets as well as the locally developed "Arash" with a range of 20.5 km (12.7 mi). There is also a rocket with a range of 75 km (47 mi). 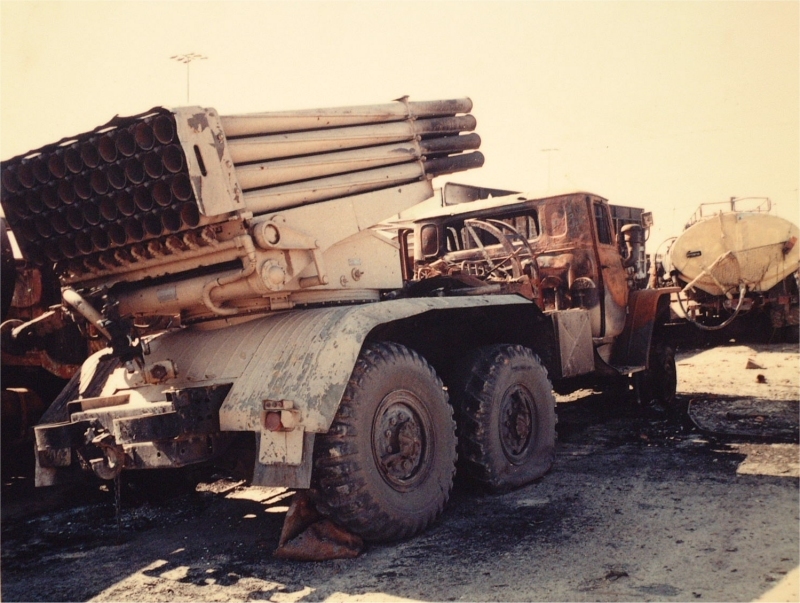 HM20 – This is the Iranian version of the BM-21, mounted on a Mercedes-Benz 2624 6×6 truck. The launch pack however consists of 2 packs of 20 tubes. Reportedly there is also a version with an automatic reload-system, latest version is mounted on 6×6 MAN trucks. HMxx – Iranian version of the 30-round BM-11, based on a Mercedes-Benz LA 911B 4x4 truck. Some vehicles are equipped with a light hydraulic crane. Various 122mm-type rockets were deployed by Iraq during the Iran-Iraq war, modified to deliver nerve agents to targets. This included the 40 inch long, domestically produced Grad MLRS-compatible "Borak" warhead designed to disperse sarin gas. KRL 122 – Kahuta Research Laboratories from Pakistan have developed a rocket launcher that is very similar to the North-Korean BM-11. The KRL 122 was originally based on an Isuzu truck but later models use the Reo M35 truck. Some sources mention the designator Gadab. In addition to the original Soviet rockets, the system can launch the "Yarmuk" rocket developed by Pakistan Ordnance Factories. The KRL 122 has achieved a maximum range of over 40 km due to the use of upgraded 122 mm rockets. APRA-40, a Romanian variant of the Grad, and a 6-rocket launcher. 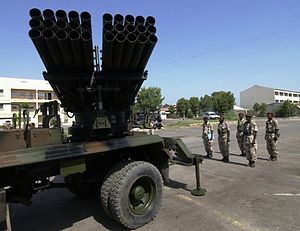 APR-21 (aruncător de proiectile reactive – rocket launcher): Romanian 21-round launcher (3 rows of 7) mounted on a Bucegi SR-114 four-by-four chassis. No longer used by the Romanian Army but some vehicles have been exported to Nigeria and Croatia. Morocco has the launch pack mounted on a Kaiser M35 truck. APR-40: Initially this designator was used for the original BM-21 "Grad" in Romanian service, but Aerostar SA has developed an improved model, based on a DAC-665T six-by-six truck. A slightly improved model, called APRA-40 or 40 APRA 122 FMC is based on the DAC 15.215 DFAEG truck. Each launcher is normally accompanied by a re-supply truck MITC with a 6t crane and a trailer RM13. 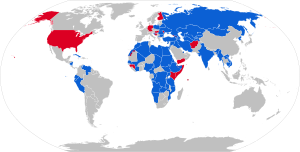 The system is also used by Botswana, Bosnia, Cameroon, Croatia, Iran, Iraq, Liberia and Nigeria. Valkiri: This is an improved South African design based on a Unimog truck chassis by Denel using 127 mm rockets. The original "GRAD" rocket has a range of about 20 kilometers (12 mi). The first modification called "G-M" increased the range to about 27.5 kilometers (17.1 mi), while the second modification "G-2000" further increased the range to about 40 kilometers (25 mi). The latest technology development has allowed new Grad rocket with 52 km range. The range may also vary due to the type of warhead. A used 122mm projectile of multiple rocket launcher stuck into muddy land in Vaharai, Batticaloa during the Sri Lankan Civil War (2007). Belarus: 126 BM-21 as of 2016[update]. Used 9P138. Laos: Paraded in January 2019. Russia: 982; rockets with the expired term using for training 9F839-1 Bobr. 2,500 (1,700 of them in storage) as of 2012 Military Balance International Institute for Strategic Studies 2012. 70 modernized Grad-M units were delivered in 2016. Turkmenistan: 70 as of 2016[update] Also used 9P138. Ukraine: 185 BM-21s as of 2016[update]. Also used 9P138. Uzbekistan: 36 as of 2016[update]. Used 9P138. East Germany : 72 units, passed on to successor states. Hungary: 40 in service in 1980. Yugoslavia: Passed on to successor states. ^ a b c d Prenatt 2016, p. 30. ^ Zabecki, David T. (May 2011). "Rockets and Rocket Launchers". In Tucker, Spencer C. (ed.). The Encyclopedia of the Vietnam War: A Political, Social, and Military History (2 ed.). p. 988. ISBN 978-1-85109-960-3. The most significant [Soviet rocket] was the 9M22M, one of the Katyusha class of 122-mm rockets. ^ Zaloga, Steven J. (2003). Tank battles of the Mid-East Wars (2): The wars of 1973 to the present. Hong Kong: Concord Publications. p. 4. ISBN 962-361-613-9. ^ Cooper, Tom; Fontanellaz, Adrien (October 2016). "La guerre du Kagera". Batailles et Blindés (in French). No. 75. Caraktère. pp. 72–81. ISSN 1765-0828. ^ a b Isby, David C. (1990). The War in Afghanistan 1979–1989: The Soviet Empire at High Tide. Concord Publications. p. 42. ISBN 978-9623610094. ^ Singh, Jagjit (2007). "Battle-Winning Role of the Gunners in Kargil War". The Battle-Winning Arm. Lancer Publishers LLC. ISBN 9788176021807. ^ Prenatt 2016, pp. 23-24. ^ Yemeni fighters have fired at least 16 Grad missiles into Saudi territories. YouTube (20 July 2015). Retrieved on 2017-06-01. ^ Splav 122 mm BM-21 multiple rocket launcher family (Russian Federation), Multiple rocket launchers, Jane's Armour and Artillery. ^ Prenatt, Jamie (16 June 2016). Katyusha: Russian Multiple Rocket Launchers 1941–Present. Bloomsbury Publishing. p. 30. ISBN 978-1-4728-1087-8. ^ "122 mm DKZ-B Rocket Launcher and Stand : Viet Cong". awm.gov.au. Australian War Memorial. Retrieved 4 February 2019. ^ ARG. "Tornado-G Multiple Launch Rocket System | Military-Today.com". www.military-today.com. Retrieved 24 January 2017. ^ "BM-21 Grad firing MRLS multiple rocket launcher system Russia Russian Army Recognition". Retrieved 23 December 2014. ^ Multiple Rocket Launcher System – RS-122. Delta.gov.ge. Retrieved on 1 June 2017. ^ საქართველოს თავდაცვის სამინისტრო. Mod.gov.ge. Retrieved on 1 June 2017. ^ "Jelcz-Komponenty". xo.pl. Archived from the original on 3 April 2007. Retrieved 12 December 2017. ^ a b c Israel and Hamas: Conflict in Gaza 2008–2009. Congressional Research Service. ^ a b "Hamas turns to Chinese rockets over homemade: 'We need weapons that work'". . World tribune. Retrieved 23 December 2014. ^ Israeli Ministry of Foreign Affairs, "Terror in Gaza: Twelve months since the Hamas takeover", 16 June 2008. ^ "Watch multi-barrel rocket launch from Gaza". ynet. Retrieved 23 December 2014. ^ "Iron Dome successfully intercepts Gaza rocket for first time". Haaretz. 7 April 2011. Retrieved 23 December 2014. ^ "Hadid HM 20 122 mm 40 rounds Multiple rocket launcher system". armyrecognition.com. Army Recognition. 21 November 2011. ^ Chivers, C.J. ; Schmitt, Eric (15 February 2015). "C.I.A. Is Said to Have Bought and Destroyed Iraqi Chemical Weapons". New York Times. ^ "POF, French company sign MoU on rocket technology". AAJ TV. 9 September 2009. Retrieved 27 May 2013. ^ "Refurbishment/Range Enhancement of 122 mm MBRL Ammunition". GIDS. Retrieved 2 July 2013. ^ "Brigada 8 LAROM". Archived from the original on 22 February 2012. Retrieved 23 December 2014. ^ "R122 mm G-2000/G-M". Retrieved 23 December 2014. ^ "MLRS "GRAD" AND IT'S MODIFICATIONS" (PDF). EDePro. Archived from the original (PDF) on 5 March 2016. Retrieved 1 May 2015. ^ "SAJAM NAORUŽANjA IDEX: Srbija ima bespilotni helikopter (VIDEO)". www.novosti.rs. Retrieved 12 December 2017. ^ Military Balance 1981, p. 40. ^ Military Balance 2016, p. 320. ^ Military Balance 1981, p. 52. ^ Military Balance 2016, p. 182. ^ a b c d e Prenatt 2016, p. 32. ^ Military Balance 2016, p. 433. ^ Military Balance 2016, p. 239. ^ Military Balance 2016, p. 434. ^ Military Balance 2016, p. 437. ^ Military Balance 2016, p. 84. ^ Military Balance 2016, p. 393. ^ Military Balance 2016, p. 85. ^ Military Balance 2016, p. 324. ^ Military Balance 2016, p. 444. ^ Military Balance 2016, p. 445. ^ Military Balance 2016, p. 184. ^ Military Balance 2016, p. 251. ^ Military Balance 1981, p. 42. ^ Military Balance 2016, p. 332. ^ a b c Military Balance 2016, p. 491. ^ Military Balance 2016, p. 492. ^ Military Balance 2016, p. 334. ^ Military Balance 2016, p. 185. ^ Military Balance 2016, p. 187. ^ Military Balance 2016, p. 340. ^ Military Balance 1981, p. 45. ^ Military Balance 2016, p. 342. ^ Military Balance 2016, p. 119. ^ Guilloteau, Christophe; Nauche, Philippe (18 July 2013). "Rapport d'information déposé en application de l'article 145 du Règlement par la commission de la Défense Nationale et des Forces Armées en conclusion des travaux d'une mission d'information sur l'opération Serval au Mali" (in French). France: National Assembly. p. 22. ^ Military Balance 2016, p. 455. ^ Military Balance 2016, p. 275. ^ Military Balance 1981, p. 46. ^ Military Balance 2016, p. 345. ^ Military Balance 2016, p. 458. ^ Military Balance 2016, p. 459. ^ Military Balance 1981, p. 70. ^ a b Military Balance 2016, p. 265. ^ "Latest rockets manufactured in China". The Jerusalem Post - JPost.com. Retrieved 23 December 2014. ^ "BBC News – Israeli air strikes hit two Gaza towns". Retrieved 23 December 2014. ^ Military Balance 2016, p. 410. ^ Military Balance 1981, p. 17. ^ Military Balance 2016, p. 127. ^ "World Military and Police Forces: Qatar". Worldmilitaryintel.blogspot.com.tr. 26 May 2013. Retrieved 19 April 2019. ^ Military Balance 2016, pp. 132–133. ^ Yanko, Eugene. "9m22u Grad MLRS | Russian Arms, Military Technology, Analysis of Russia's Military Forces". Warfare.ru. Retrieved 22 July 2012. ^ ЦАМТО / Новости / Главком Сухопутных войск сообщил о поступлении новых вооружений. Armstrade.org. Retrieved on 1 June 2017. ^ Over 60 Tornado-G MLRS and 20 Msta-SM howitzers delivered to Russian Army in 2016 72912163 | December 2016 Global Defense Security news industry | Defense Security global news industry army 2016 | Archive News year. Mail.armyrecognition.com (29 December 2016). Retrieved on 2017-06-01. ^ Camello, Maria (30 November 2018). "Exportations d'armes au Maghreb : quelle conformité avec la Position commune?" (PDF). Rapport du GRIP (in French) (2018/6). ^ RM-70 Multiple Rocket Launches with Polisario Forces Aain Um Serusa Polisario Camp, Western Sahara (sanitized) (Report). Central Intelligence Agency. 26 March 1982. ^ "Senegal parades new BM-21s and armoured vehicles". Janes.com. 11 April 2017. Retrieved 1 June 2017. ^ Military Balance 2016, p. 466. ^ Military Balance 2016, p. 469. ^ Military Balance 2016, p. 471. ^ Military Balance 2016, p. 202. ^ Military Balance 2016, p. 473. ^ Military Balance 2016, p. 475. ^ Military Balance 2016, p. 208. ^ Military Balance 2016, p. 416. ^ Military Balance 2016, p. 476. ^ "French soldier killed in Mali, 20 rebels dead". Reuters. 19 February 2013. Retrieved 20 February 2013. ^ Military Balance 1981, p. 16. ^ Military Balance 1981, p. 105. ^ Military Balance 1981, p. 50. Prenatt, Jamie; Hook, Adam (2016). Katyusha – Russian Multiple Rocket Launchers 1941–Present. New Vanguard 235. Oxford: Osprey Publishing Ltd. ISBN 978 1 4728 1086 1.
International Institute for Strategic Studies (1980). The Military Balance 1980-1981. Routlegde. ISBN 0-85368-197-X. 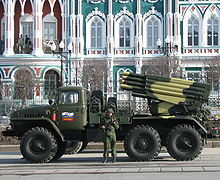 Wikimedia Commons has media related to BM-21 Grad.